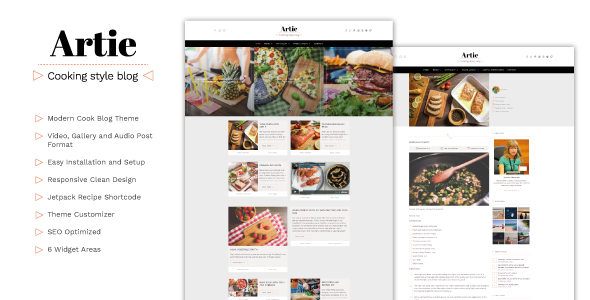 Artie is a modern and easy-to-use WordPress theme specially built for bloggers who love sharing her recipes, tips and writings about food. It comes with a crafted design and options very easy to setup for styling the blog layout (one column plus a sidebar or two posts columns), many post formats and featuring your most important posts marking them as sticky. Artie includes support for Featured Content, allowing you to showcase the most important content as a slider on the top of your homepage. Use this area to make sure your readers notice your best articles. With options for styling the blog layout and support for Post Formats (standard, video, gallery, image and audio), Artie gives your personal blog a modern look. Moreover you can use shortcodes to embed a recipe with list of ingredients, steps, basic metadata, and an option to print, making your post view special and unique. If you need more engagement with your readers, Artie has six widget areas where adding different tools and content to your site. About social networks, Artie allows you to display links to your social media profiles, like Twitter, Facebook and Instagram with icons using a Social Links menu. You can also include sharing buttons for your readers to share your content across a range of social networks and services at the bottom of each post and page. And finally, if Instagram is one of your featured social network, you can add a feed with your last content above the footer using the Instagram Widget in the Prefooter Widget Area.